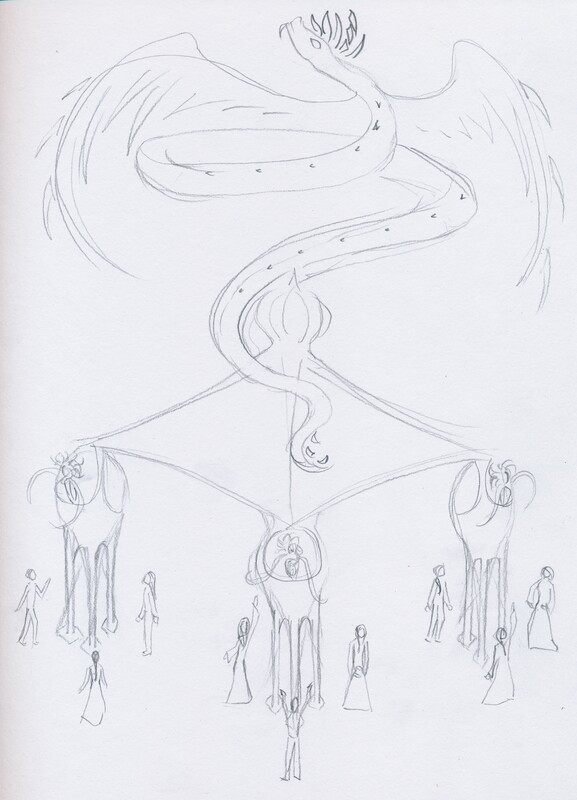 A twenty-one person assembly waited atop the Verdant Plateau – one dragon, four Aquarii, and sixteen humans arrayed above, inside, and around the Pergola. The procession halted at the plateau’s edge, and alone the ruling family disembarked to join them. The Queen’s voice rolled out over the surrounding valleys, transmitted into space beyond. “Now with all the peoples of the Imperium, we light the sky with the Pyrean Vision.” The Magus family turned to face the great Pergola, and together sat on their knees. The four Aquarii in their respective corners of the Pergola began to shimmer warmly. The four humans surrounding each Aquari raised their palms, and the light around the Aquarii grew. A deep, melodic thrumming pervaded the air as their spheres of light widened to intermingle, beaming through the open Pergola. Chrysanthe’s father took a deep breath, and laughed. “This event is unique, ‘Santhe. Them up there are the ones that start it, but actually we all get to take part.” At no response but silence, he checked to see his daughter’s face transfixed by the spectacle. Aural melodies began to wail, soar and syncopate. Intricate brightness enveloped the entire Pergola, reaching the coiled body of the dragon perched in massive flying form on the roof. Its silver-blue scales flashed as it took to the air, gently spiraling to float high above. The mass of light gained focus, a streaming latticework that converged on a pulsing point centered above the structure. “It’s all joined now, see, and they’re making sense of it.” Glowing geometry transformed through a series of iterations that became more concise and graceful. The central point grew brighter till it burst upward, illuminating the sky all the way to the dragon above. “Let’s see, that’s not Arkuda…” He pulled the event program from his pocket. “That’s Arctyri, of Foshan. Saga, Kyridi, and Rhizoa are on the other three planets this Midsummer.” The young girl repeated the names quietly. The light revealed the dragon’s greater spectral being, extending through the sky in whorls and spikes. Arctyri’s body navigated a toroidal pattern, bending and channeling the light in this shape. The color of the sky began to change. “You’ll see. You’ll know!” Chrysanthe held her father’s hands and craned her head to watch. The sun was setting to her left. Between the growing night and fading day, the sky did resemble a conduit reaching through the universe; though instead of being dark, it was varicolor luminescent. She untangled a hand to reach up to it. The combined light of four sunsets filled the air overhead, breathed in by the motion of the dragons’ flight. The colors gained substance and weight, falling like mist until they reached upraised hands. It wasn’t like rain or snow, but Chrysanthe felt it, an electric sparkle that raised the hairs on her skin. It reminded her of things: warm cereal in the morning, dancing to the music her parents played. She saw the colors respond around her hand, and she did know just what to do after all. She tilted her head as the lines and figures issuing from her father’s hand rose to meet her own small pictures. The expressions were abstracted, but when they joined, it somehow made a little more sense. Chrysanthe turned to see it happening everywhere around her. The sunsets’ light was fading, and the grand picture grew brighter in turn. She could see lines now that didn’t come from around her, but from somewhere across the galaxies, and they too connect into the picture with meaning. It seemed miles wide. Arctyri above released the energy from the glowing torus, sending it back to the central focus. As a point of static harmony was reached, the Aquarii sent the energy crackling back through the pattern, rays of light connecting disparate lines. When the big egg came falling through the vision like a springtime surprise, Chrysanthe wondered what amazing thing would come from inside. This entry was tagged Aquarii, Arctyri, Bones of Starlight, Book 1, Chrysanthe, dragon, Eva L. Elasigue, family, fantasy, father, Fire On All Sides, humans, intergalactic, Kyridi, Magus, mythical, novel, peoples, Primal Spiral, Queen, Rhizoa, saga, science fiction, series, space opera. Bookmark the permalink.